In our previous articles, we have talked briefly about some of the many different light fixtures available for purchase. From rustic pendant lighting to sleek recessed lighting, there are many different lighting products that are suitable for every type of home. However, knowing which type of light fixtures are right for you can do much to help create the most aesthetic end result possible. In today’s two-part series, we will be looking at a few of the endless light fixtures available for you to choose from, so that you can get a better idea as to which lighting products will complement your home best. If you are searching for Bozeman’s top lighting company that offers the widest selection of lighting products, look no further than Distinctive Lighting. As the highest-rated lighting company in Gallatin Valley, we work hard to ensure that we exceed the expectations of all our customers so that they are left with a finished product that they truly love. We are able to maintain our continuous commitment to all customers thanks to our team of lighting experts that possess years of relevant knowledge. If you are interested in learning about a few of the endless lighting options available to you, read part one of our two-part series below! A popular choice for both interior and exterior lighting, wall sconces have a way of transforming any drab home into an upscale retreat. While wall sconces are typically used as a source of ambient lighting in hallways and living areas, they can also make exceptional accent lights under the right circumstances. For example, if you have a built-in bookcase or a painting that you want to showcase in your home, wall sconces can be the missing piece to bring your home’s interior to life. For this reason, wall sconces remain as one of the most diverse lighting products today. Ceiling fans are exceptional products that can be placed indoors in highly trafficked areas, or outdoors under covered areas such as a patio. As such, ceiling fans are available in a wide variety of sizes and materials to accommodate every climate imaginable. For this reason, Distinct Lighting offers a number of fan accessories, fan controls, fitters, fan blades, and much more to choose from. So whether you’re in need of a ceiling fan for those hot and humid days, or are just looking for the best way to circulate air throughout your home, Distinctive Lighting is here to help. The perfect lighting products can do much to spruce up your kitchen and dining area. While many turn to recessed lighting or pendant lighting when installing lighting in their kitchen, under cabinet lighting is perfect for creating a dramatic yet elegant mood in your home. Not only is under cabinet lighting perfect as task lighting, it can also be used as ambient lighting at night when trying to navigate through your home in the dark. These lighting products are simple to install, and the end result that they produce is truly breathtaking. Bathing your room with adequate lighting can be difficult, especially if you don’t plan on placing bedside lamps in your room. For this reason, floor lamps can be a great alternative to bedside lamps, and often disperse light more efficiently than a bedside lamp would. Floor lamps are available in a wide variety of colors and styles, and some even feature multiple light bulb sockets if your room requires additional levels of light. At Distinctive Lighting, we offer more than 1,600 unique floor lamps, ensuring that you can find the perfect lighting product for your needs. 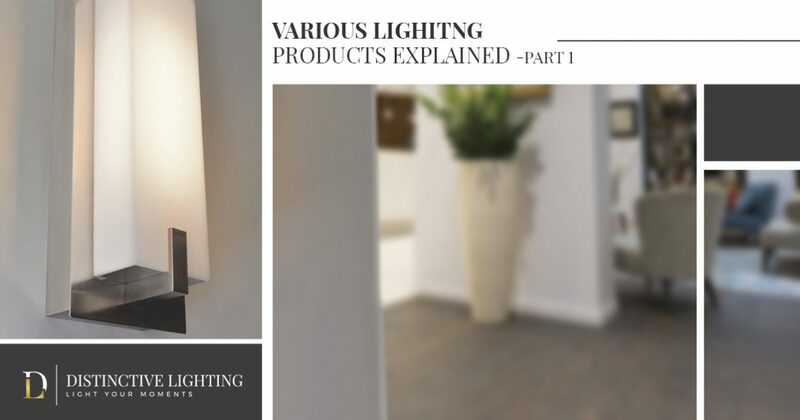 Stay tuned for part two of our multi-part series, where we will be taking a look at four additional lighting products that are suitable for every home. If you would like to learn more about the best lighting products for your home, visit our lighting showroom in Bozeman today! We know that you will be pleased browsing our wide variety of lighting products, and we are always available to help you find the perfect light fixtures for your personal needs. To learn more, simply get in touch with our team of professional lighting experts at Distinctive Lighting!